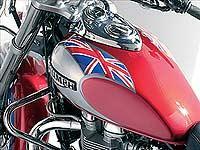 Triumph’s cruiser-styled Bonneville America was the British firm’s best selling motorcycle of 2002, thanks to buyers in – you guessed it – America. While Europeans have been regarding the model with relative caution, the 790cc twins have been selling in the US like 49-cent burgers. And Triumph thinks the bike can do better still over the pond, while possibly picking up a few more fans on this side, too. Enter the aggressively named Speedmaster. It’s sportier than the laid-back Bonnie America, though it uses many of the same parts, including the air-cooled engine. There is some logic behind the improbably racy name – Speedmaster was the unofficial tag of a 650cc Bonneville back in 1964. And Triumph reckons the sportier image will appeal to a younger audience. The eight-valve dohc parallel twin retains the offbeat 270-degree crankshaft layout introduced with the America (the first Hinckley Bonnies had a 360-degree crank). It produces an identical 61bhp at 7400rpm, but has lower gearing for better acceleration. The tubular steel frame, thick forks and angled rear shocks are also retained, but much of the chassis is new. There’s also a smaller front mudguard; flatter, narrower handlebars held by aluminium risers; and a so-called " gunfighter " one-piece seat instead of the America’s saddle-plus-pillion-pad arrangement. The Speedmaster also has cast aluminium wheels instead of wire spokes; and twin discs instead of one up front. The overall look is cool in a distinctly Triumph-like way, notably in the traditional two-tone paintwork on the tank, and the chromed instrument console that now includes a rev-counter. The new bars give a slightly more leaned forward riding position than the America, but this is still very much a cruiser. You sit low and upright, with feet well forward, looking out over a white-faced speedo that’s more reminiscent of an old Vincent. There was little of the sensation of riding old British iron when you fire it up, though. This Triumph rustles with modern-day efficiency and transmits barely a hint of vibration due to its twin balancer shafts. Throttle response from the twin 36mm carbs is equally smooth. The Triumph is reasonably quick, too, its lower gearing and slick five-speed box giving lively acceleration away from junctions, and its broad spread of torque – 90 per cent of the maximum figure is produced from 2750rpm – encouraging a relaxed but respectably rapid pace. Triumph’s new-age twin isn’t the most entertaining of powerplants, tending to feel a bit bland due to its lack of either real grunt or top-end kick. But its quiet efficiency will suit many riders just fine. The Speedmaster certainly lives up to its cruiser billing by staying smooth and unstressed at any pace from a lazy 50mph to a neck-strainingly unsustainable maximum of 115mph. Much of the credit for that must go to the chassis. The Triumph is stable at speed on the freeway, comfortable thanks to its compliant suspension, and firm enough to be enjoyable when the roads get twisty. At 229kg (504lb), it is reasonably light by cruiser standards, and its brakes give plenty of stopping power, answering one criticism levelled at the single-disc America. Steering is slow but neutral, ground clearance adequate and the Metzeler tyres are sticky enough to make reasonably good use of it. For all its racy name and supposedly performance-oriented image, this is essentially a competent, soft-tuned, friendly machine that looks good but is unlikely to set its rider’s trousers alight with excitement. It’s well priced too – even more so in the States – so don’t bet against a Bonnie being Triumph’s best-selling model this year, too. The Triumph Speedmaster offers a simple, cruiser-style alternative to the Triumph Bonneville.